When a client walks into a therapy room, they may not know what to expect. They might be anxious or unsure of what their role will be, maybe even fearful others won’t accept them or think they're unintelligent or unworthy. It takes time for individuals to get used to therapy, whether it's group or individual sessions. Rushing right into deep discussion may create undue stress, and support unhealthy behaviors, such as withdrawing, talking too much, acting silly or sarcastic, or leaving the room to alleviate anxiety. Warm-up exercises are a great way to test the waters. 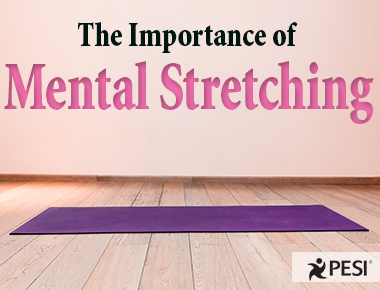 Mental Stretching exercises are usually five to ten minutes in length and help clients become familiar with self-expression and communicating with others. The warm-ups are relatively simple, effective and free of expectations and the participant is reassured that he is in charge; there is no right or wrong way to approach the warm-up. The warm-ups are never judged; the results are explored and the client decides when, how, and with whom he will share his artwork. These creative exercises provide those mini successes for motivation and full engagement in therapy, helping clients gain self-esteem by taking tiny steps forward. When you provide an almost guaranteed successful outcome, your client is likely to feel comfortable and share issues and concerns. This relaxed approach and attitude makes warm-ups powerful. Clients let their guard down, sharing feelings and experiences more often when they aren't worried about how they or their work looks to others. If a client discounts their work during the warm-up, it's common for other group members to support and encourage him to continue, and not worry about the end product. This interaction becomes the client’s first bonding experience with the group. In one recent session, a client named Bob wanted to throw his work out; he thought it was ugly and messy. When he started crumpling it up and walking towards the garbage can, a few returning clients pleaded with him to keep it. They told him his work was valuable and all that counted was self-expression, knowing that drawing skills weren't mandatory. Clients don't need artistic skills to engage in these warm-up exercises during sessions. If writing is included in an exercise, the client doesn’t need to know how to spell or use proper grammar, nor does it need to be neat or even legible. Almost anything goes during these exercises. Susan I. Buchalter, ATR-BC, CGP, LPC is a board-certified art therapist, licensed professional counselor, and certified group psychotherapist, who has spent over 30 years leading art therapy and psychotherapy groups. Susan is the author of A Practical Art Therapy, Art Therapy Techniques and Applications, Art Therapy and Creative Coping Techniques for Older Adults, and more. She has a private practice in Lawrenceville, New Jersey. Want unique, hand-selected exercises that increase self-esteem, self-awareness and feelings of success? 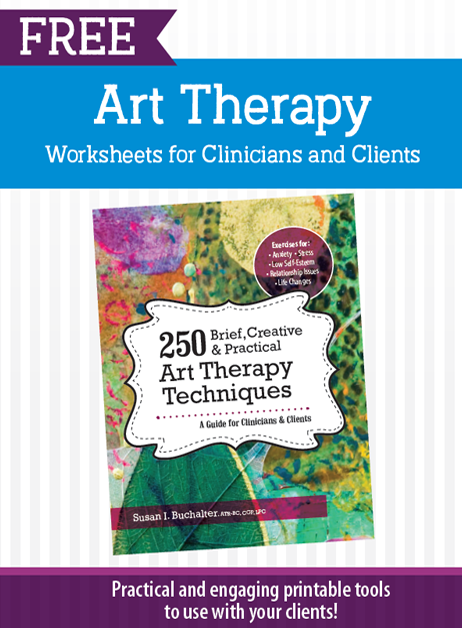 Check out these FREE Art Therapy resources today — you'll be able to implement them into your practice immediately!